We are continually serving, empowering, and working alongside our neighbors in the St. Louis Park community and throughout God's world. We would love to welcome you along for the journey! Below is just a sampling of some of the places you'll find us at work. Our Newsletter has more information about specific projects each month. STEP is a wonderful organization within our community that helps provide people in need with food, clothing, transportation, emergency assistance, and connections to other services. Spirit of Christ is a proud supporter of STEP, especially through ongoing donations to their Food Shelf. In the winter, we also collect blankets, warm scarves, mittens and hats for the Clothing Closet. Each Spring our Sunday School kids (along with other members who like to play with clay) create artistic soup bowls that are donated for STEP's annual Empty Bowls fundraiser. Check out stepslp.org for more information about their services and events. Check out our Newsletter for more information on current donation drives. TreeHouse is a faith-based organization offering hope, guidance, and unconditional love to at-risk teens dealing with tough issues such as depression/suicidal tendencies, substance abuse, truancy, self-injury and sexual activity. Their balanced programs meet the social, emotional, physical, intellectual and spiritual needs of at-risk teens. TreeHouse provides a safe environment and mentorship for teens to receive support, guidance and practical skills in making better choices today to live as healthy adults tomorrow. At TreeHouse, long-term, committed, trusting relationships are formed. Teens care about what we know, because they know how much we care. We listen, affirm and support. TreeHouse is a place to have fun, meet friends, discover faith, overcome pain, serve others and be empowered by staff to succeed. Teens experience grace at TreeHouse and are reminded they are lovable, capable, and worthwhile. Hope is realized when a teen understands their value has nothing to do with performance but instead is based on unconditional love and acceptance from God. To learn more check out the TreeHouse website! TreeHouse is just up the road from Spirit of Christ and it is an honor for us to participate in this life-changing work! If you like to cook, consider organizing a group to serve a meal at TreeHouse. Contact us for more information on how you can help TreeHouse. Every month, SOC members serve a meal to more than 40 shelter residents and staff at Our Saviour's. 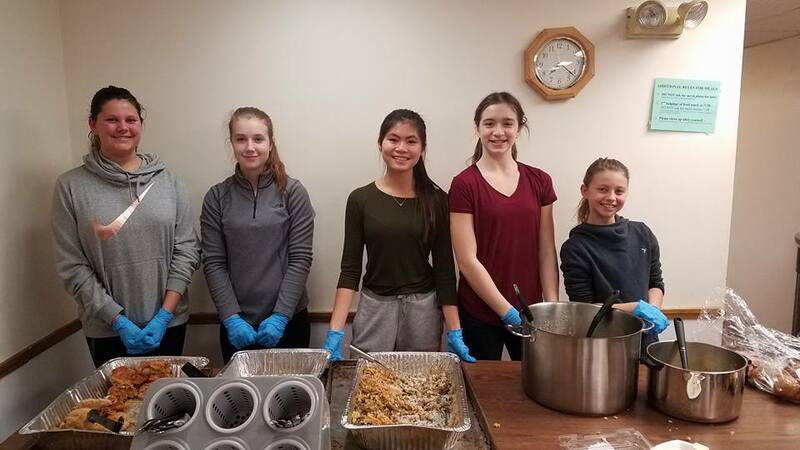 Members donate funds for groceries along with cans of coffee, tea, and many delicious homemade treats and favorite family side dishes that are appreciated by the shelter residents. Residents of the shelter and the staff tell us that our meals are some of their favorites! Our baked chicken is fall off the bone tender, served with a variety of sides depending on the season. And our famous French toast is a hit at breakfast time. We invite you to serve a meal with us! In January, March, May, July, September and November, we prepare an evening meal on the 2nd Friday. In February, April, June, August, October and December, we serve a hot breakfast on the 2nd Saturday. Contact us if you'd like to come along and help! We also collect donations for the shelter occasionally throughout the year. Check out the Our Saviour's Wish List and see what you can donate! The Bird Feeder is a food shelf at St. Louis Park High School operated by students for students. They're in their third year of providing weekend food packages, disguised as backpacks, for students who receive little to no food over the weekend so they can come better prepared to learn on Mondays. During the Holiday season they pack holiday meals and extra groceries for families over the long break. Spirit of Christ donates food regularly to keep the Bird Feeder in business. Keep an eye on our Newsletter for updates on our donation drives. You can learn more about the Bird Feeder at theslpbirdfeeder.weebly.com including how you can help out and their Top Ten list of items to donate. There are also many opportunities to serve at church. If you would like to help usher on Sunday mornings, operate the worship PowerPoint slides, mow the lawn in summer, shovel the sidewalks in winter, or help out in some other way please contact us and we'll help you get started! Spirit of Christ Community Lutheran Church is located in St. Louis Park, MN. We are part of the Evangelical Lutheran Church in America (ELCA). Each Sunday at 10:00am we worship using traditional Lutheran liturgy and a blend of classic and modern hymns. Please join us, all are welcome at God's table! Need more information? Want to get involved? The Annual Report of the Congregation is available for download. Please click on the link below to access the report.